There is a social revolution which seems only to have begun; but there is also something more profound — a revolution in consciousness. Conceivably it could alter the whole aspect of America and produce a new species of American. This was written before the governmental crisis that has come to be known as Watergate began to flood the collective consciousness of the American people, compelling all men and women earnestly concerned with the future of this country and of its way of life to question many of the things they had always taken for granted. Watergate is only a symptom. The highly complex situation and the involved meshing of interrelated practices — and malpractices — to which it refers is not without antecedents. But the way it broke out and spread, and the character of the President around which it has pivoted, whatever his personal role in the chain of events, present a unique subject of study not only to the social historian but to every objectively thinking American. 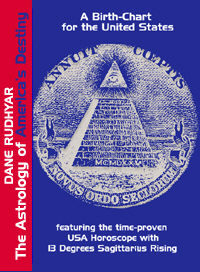 If that person is convinced of the validity of astrology and aware of the astrological factors which operated at the beginning of the nation and have been operating both at the time of the 1972 electoral campaign and throughout this 1973-1974 period, the Watergate crisis appears in an even more significant, deeply symbolic, aspect. Watergate has brought to light problems, dilemmas and compromises that have been inherent in the fabric of American society since its beginnings. It impels us to look far beyond the illegal machinations of a few persons in and around the White House, and perhaps to wonder if we had truly understood and properly evaluated the way in which our institutions were formed and have developed during the two centuries of our national existence. We must reconsider the meaning and purpose of the United States of America. We cannot understand this meaning and purpose unless we are aware of all the factors that contributed to the formation of "these United States," giving the nation its unique character and, what is more, its place in time and space and its function in the historical process of man's evolution — an evolution we believe to be toward higher, more encompassing forms of collective consciousness incorporated into pervasive and lasting institutions. How can we estimate and formulate this unique character? Astrology can give a significant answer to this question, in the same way in which it is able to characterize the meaning and purpose of an individual person, and to outline the essential curve of development of his life and personality. The astrologer erects a birth chart for the exact time and place of a person's first positive act of relationship to his cosmic and social environment, his first breath. We can do this for an individual person, and we can also do it based on the moment and place that can be considered the "first breath" of a collective person, in this case the United States of America. I shall presently discuss the problem involved in the determination of the exact moment of such a symbolic first breath, but first it seems necessary to define as clearly as possible what in my opinion an astrological birth chart represents, and what can be inferred from it. Many people acquainted with astrology in its popular form may think that all astrologers agree as to what a birth chart represents and what the basic factors used in its interpretation signify. This, however, is not the case; there are many schools of astrology, just as there are many schools of philosophy, psychology and medicine. The homeopaths and the osteopath's approaches to disease and cure are fundamentally different from that of the allopath , the officially recognized M.D. Behavioristic psychology and Jungian or transpersonal psychology view the human psyche and its reactions in totally different ways. For the empiricist and the metaphysically oriented philosopher, men and the universe have dissimilar, if not totally opposite meanings.